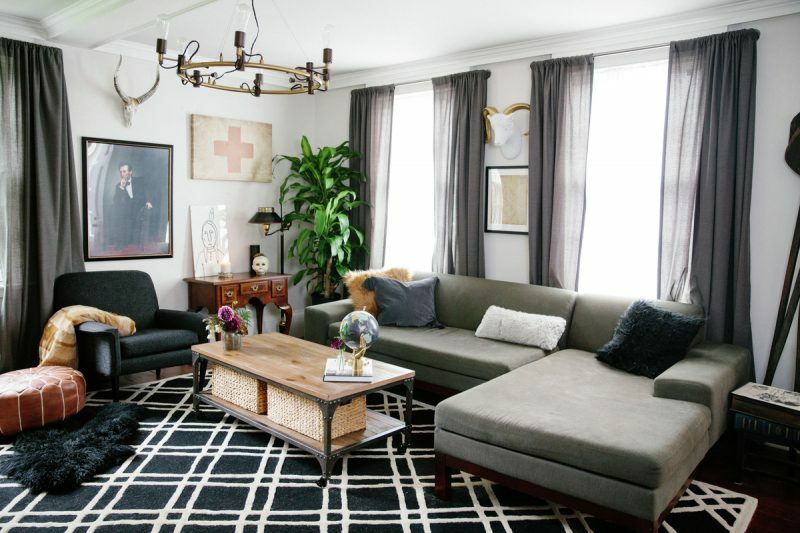 An Eclectic Dream Home in Salem (Part One) | Havenly's Blog! 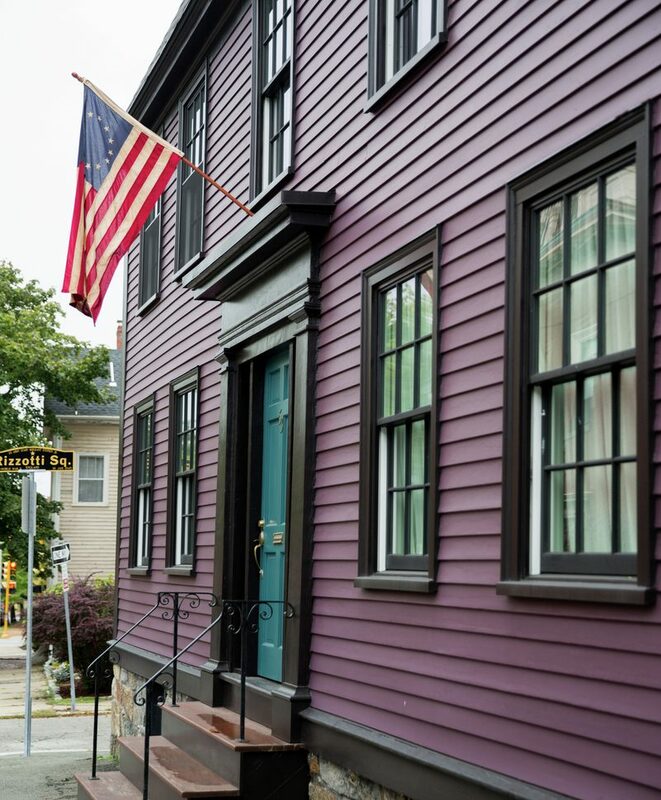 What happens when a pair of history lovers buy a colonial-era home in Salem, MA? Magic, of course.. Inspired by the location and era in which it was built, this house takes bold risks that paid off beautifully. Today, we’re sharing images from the public spaces of the home. Quirky architecture forms the backbone of this home. It was built in the eighteenth century, but the owners knew as soon as they saw it that it was something special. It’s painted purple and located across the street from the graveyard where the original owner was buried, and the wife of Nathaniel Hawthorne, author of The Scarlet Letter, was also born here. If that isn’t special, we don’t know what is. 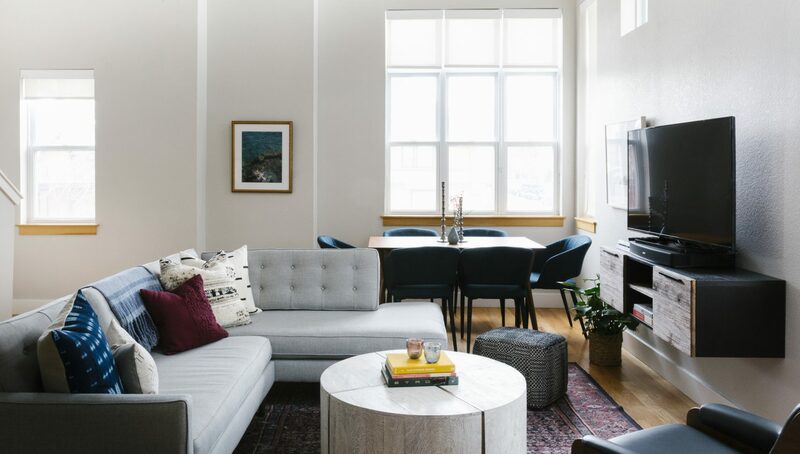 After working with several Havenly designers to add finishing details to the space, the home is a magnificent example of well-defined personal style brought to life. 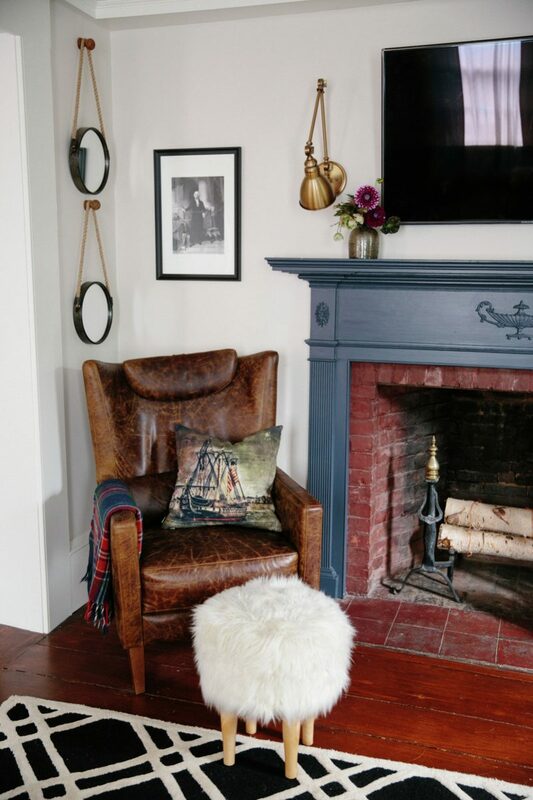 The room is completed with a stately fireplace paired with a classic leather wingback chair. Fun was injected into the space with fluffy stools and art that speaks to the owner’s funky aesthetic. 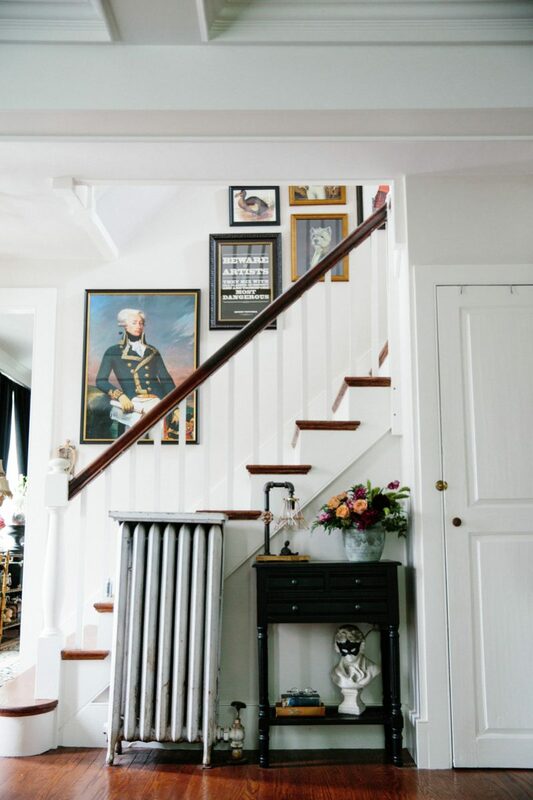 In the entryway, the staircase acts as a gallery of fun, self-referential art prints. A small console table acts as a drop zone for visitors. Across the entry is the dining room, designed as a sort of “captain’s parlor”, a riff on the nautical past of Salem. 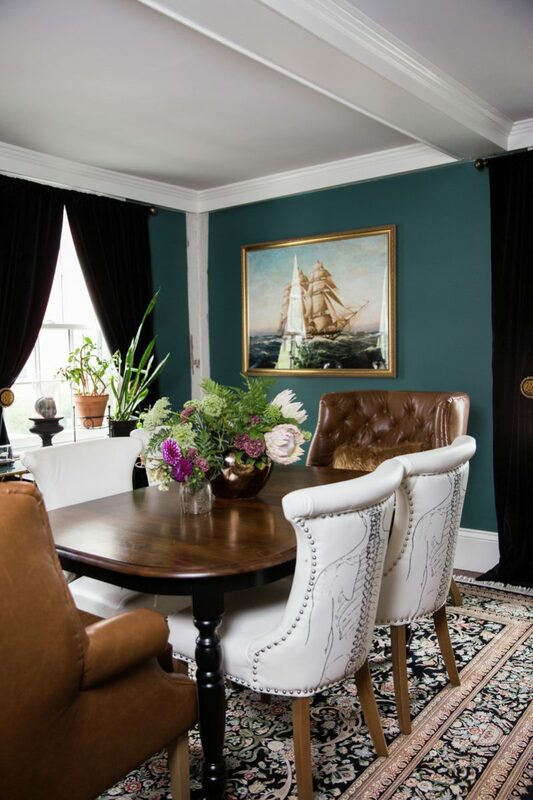 The owners went bold with dark green paint and dramatic furnishings. The dining chairs were a serendipitous find– the homeowner bought two at an antique shop, only to find four more years later to complete the set! Next to the table, a mantel exhibits historic treasures and curiosities. But, the true showstopper of the space is the wall of sconces. 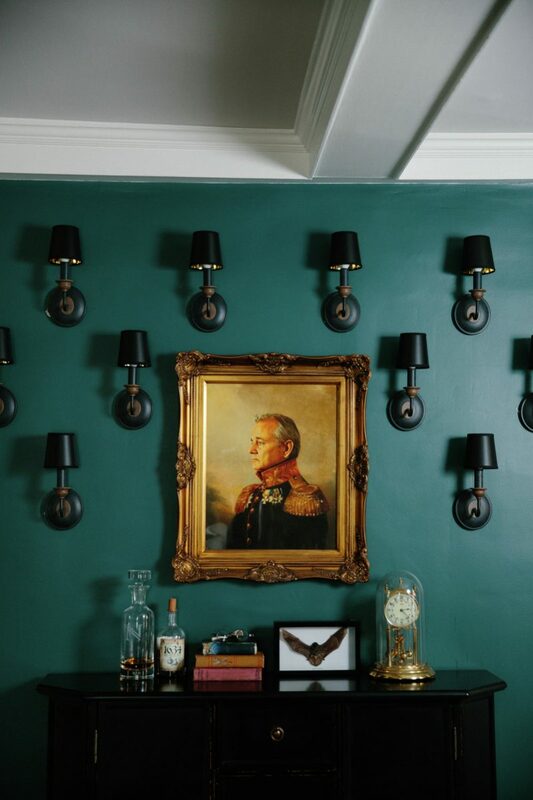 Used as an art installation, classic sconces make a huge impact that truly speaks to the personality of this home. Adjoining the dining room is the final bold statement for the home’s first level. 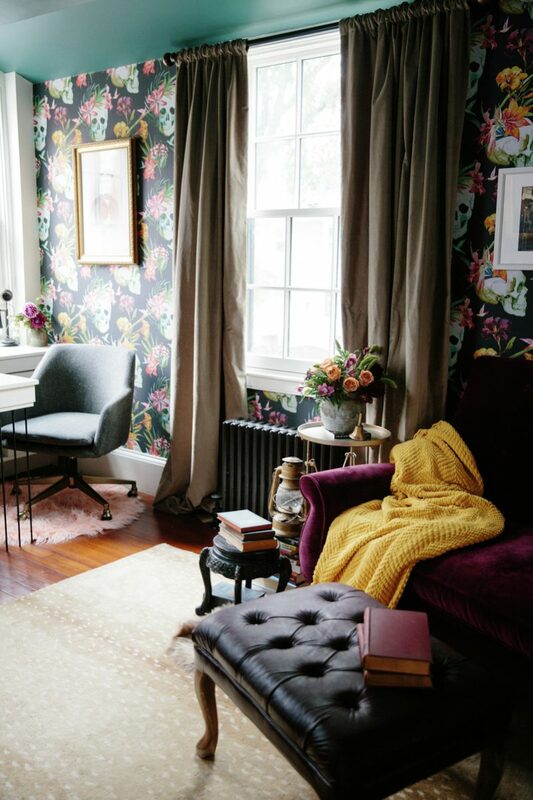 The office area provides a space to work from home, but is also a fabulously dramatic space that hides plenty of delightful details. 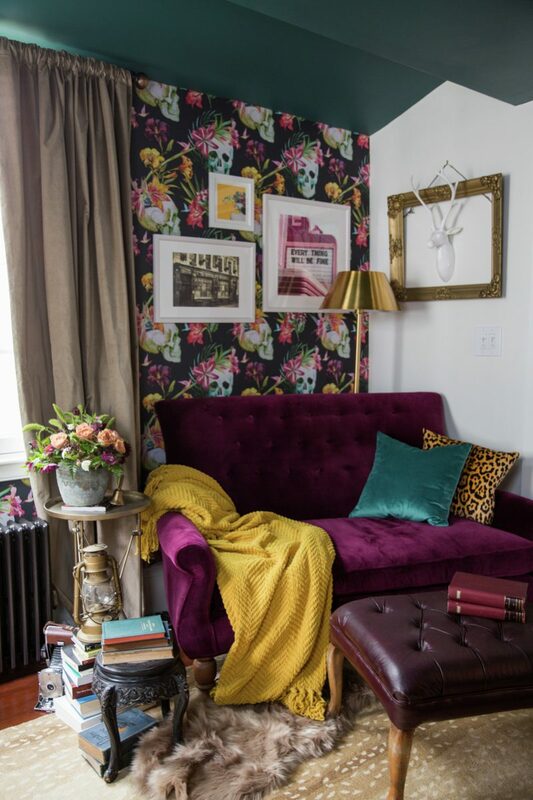 A beautiful purple settee draws the eye and matches the skull wallpaper perfectly. There’s a fireplace tucked away in the office too, adding a super-cozy vibe to the space. This Salem home is a true labor of love, and it shows. We can’t wait to share even more images from this amazingly atmospheric space later this week!